Spending time outdoors can be an invigorating experience for many, often times even in the winter months. Some will enjoy hunting, fishing, hiking, or just being out in the fresh air. Others are out there year-round due to work. No matter the reason for being outside in the winter months, the cold weather can be brutal. You can layer your clothing for warmth, even slipping on heavy boots to keep your feet warm. But there are times when thick socks and boots don’t provide your feet with enough warmth. All items on the previous list were high-quality products. This updates replaces two that had the lowest, yet high ratings. The items have been rearranged in order of highest quality and popularity. 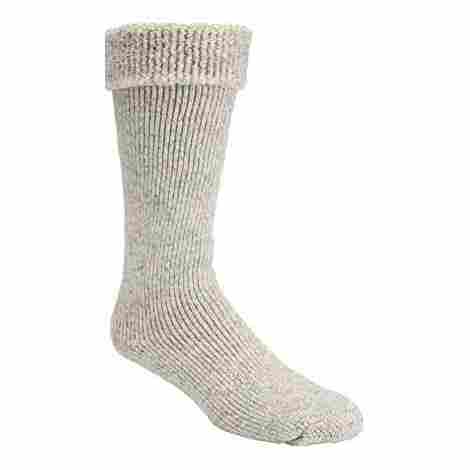 The new items are the Wigwam Men's Merino Wool Comfort and SmartWool Trekking Heavy Crew Socks. My family can attest to the fact that once your feet do get cold, the rest of your body seems to follow. The good thing for all of us is a little invention called foot warmers. A foot warmer, no matter what kind you choose to use, can be a real lifesaver at times. They have the ability, to keep your feet cozy and warm when you need it the most. There are plenty of options on the market for foot warmers. Choosing the correct one for you isn’t that hard when you think about it. You can find foot warmers in the form of thicker socks or even battery powered socks. There are also warmers that you can place inside of your boots to keep the chill off of your feet. Here you will find that we have gathered a list of ten potentially great choices for warming those feet during the colder months of the year. It is best to choose the warmer that will best suit the situation you plan to use them in. There are some on the list that you can even carry in your bag or pocket so that you are prepared for anything. The Merino Hike is one of Wigwam’s most popular styles. The socks are durable and comfortable. The thickness and appearance can be deceiving. They can be worn hiking when the sun is blazing as well as in the snow. They can be worn all year. The socks are meant for light hiking and casual use. There is a thickness around the foot. The socks are not the tailored fit of performance-oriented models. For short hikes, spending time in a cabin or cold weather, they are ideal. They are fully cushioned with a seamless toe closure. The socks are available in five sizes - MS, small, medium, large, and X-large. They keep feet dry and comfortable. If they get wet, they quickly dry. The socks absorb sweat well and do not cause feet to become overly hot in humid weather. 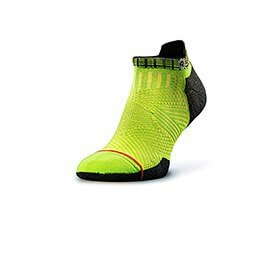 The fiber makeup of the socks consists of five percent acrylic, seven percent elastic, 21 percent stretch nylon, and 67 percent Merino wool. Merino wool is not rough and bulky wool. It is soft to the touch. Merino wool is warmer than cotton without the bulkiness. It is breathable and can be worn in the summer. The Wisconsin-based company of Wigwam has proven Merino wool socks do not have to be terribly expensive. The price undercuts the competition by quite a bit. The 67 percent Merino wool is in line with the competitors. With Wigwam socks you can have Merino hiking socks without compromising quality. A sock with only 15 to 25 percent Merino wool still carries the Merino name but is not the premium quality of this sock. 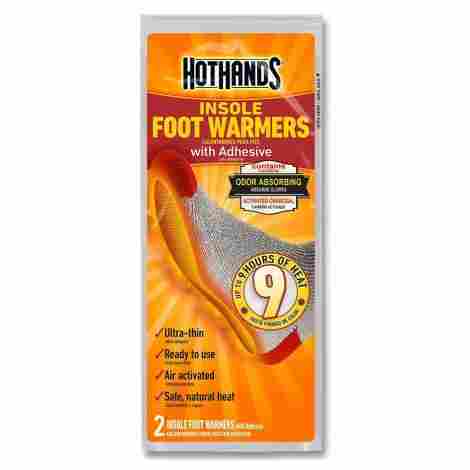 These are for those of you just looking to hold the chill off of your feet. They come in plenty of options for both style and size while protecting your feet inside of your boots. Thermal socks are made from thicker materials than your everyday socks. These are great for those people who don't quite need the warming provided by an actual foot warmer. Add these over your regular socks before placing your feet into your boots. This creates another layer of defense against the cold. An issue that many people have with using thermal socks is the actual fit. Often times this type can cause bunching both inside and out of your boots. These will retain their integrity wash after wash, allowing them to stay in place rather than bunching up causing discomfort. Thermal socks will cost more than the average pair. 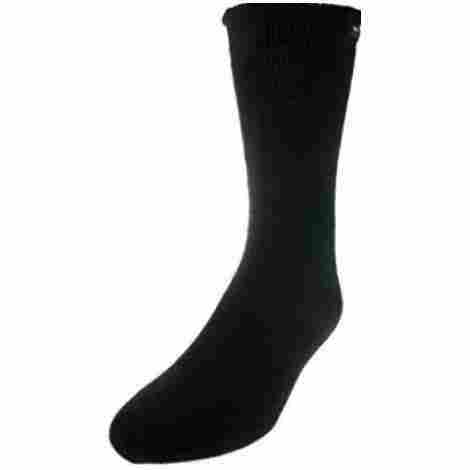 When looking into thermal socks you can find them sold in pairs much like these are. You have plenty of options for color so I'm sure you will find some that will suit your sense of style. These thermal socks are rated to be seven times warmer than wool. The top of the sock is designed to prevent downward sliding. These are sold in a set of two pairs. Sizes range from adults all the way down to childrens. Some users have concerns about the socks durability. The sizes seem to be larger than what the chart says. SmartWool has a reputation for making high-quality socks. People who like SmartWool’s lightweight socks will be happy with these as well. The bulky socks have the traditional feel and look as the Hike Light Crew. They are the ultimate in comfort. The socks are great for leisure and active use. These socks are made of one percent spandex, 29 percent nylon, and 70 percent Merino wool. Dry comfort is provided by Merino wool that naturally wicks moisture. The socks have a flat knit toe seam. The socks wear well and pad the feet. The Trekking Heavy Crew provides a boost in thickness and warmth around the foot. The socks work well for summer backpacking and winter outdoor activities. They have a high-density instep and sole that guard against blisters, lace pressure, and abrasion. Ample cushioning is provided in the ankle and seam. They are machine washable on a warm, gentle cycle.Turning them inside out is recommended. No bleach should be used. Hang or tumble dry on low. The socks should not be dry cleaned. They keep their shape when washed. When ordering, keep in mind, they add a noticeable amount of bulk. 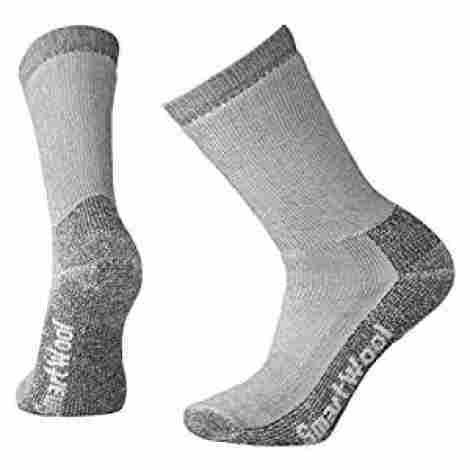 The SmartWool sock is a better overall fit than some of its competitors. They are priced much like other quality socks made for winter wear. The socks are thick enough that some people wear them as slippers. The cushioning offers significant impact absorption needed for backcountry excursions. The socks withstand a lot of hard use. They keep their stretch and last a long time. The socks are intended for either gender. They are come in five colors - green, navy, gray, loden, and taupe. Here is another potentially great pair of thermal socks that can aid in keeping your feet warm when you need it. Having warm and dry feet will enhance your outdoor experience, as we all know that cold feet can be hard to handle. These thermal socks are made from a blend of materials known not only for its ability to keep your feet warm, but they will also keep your feet dry and comfortable. You can throw these socks right in with your next load of wash as they are machine washable. Just be sure that you don't dry these on a high heat setting, as it is recommended that you use low heat for drying these socks. These thermal socks will come as a set of two pairs and fall right in line with the rest of the thermal socks on the market as far as cost is concerned. They have the ability to keep your feet warm, dry, and comfortable for the entire day. Made from a blend of materials known for there ability to keep your feet dry. These thermal socks are comfortable. These can be machine washed. They are available in different colors and patterns. These socks are shorter in length than expected. Some complain that the socks are heavy and bulky. The processes used to create the next pair of thermal socks on the list will have you looking no further for warmth. This manufacturer has perfected the process to give you a pair of socks that are beneficial to your feet while you are out in the cold. 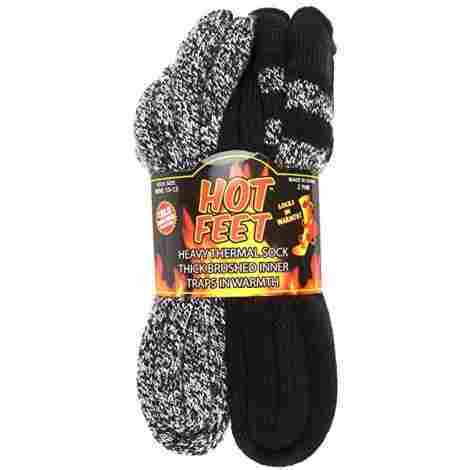 The manufacturer for these has set out to make their thermal socks stand out in the crowd. So far that seems to have worked for them. The trademark process they use to create their product has given you a thermal sock that is said to be three times warmer than any other option on the market. These provide added padding to all the right places that your foot will need. This makes them comfortable when paired with your boots or for just lounging around the house. As with any thermal type of sock, these will cost more than your average pair. The valuable quality you receive will speak for itself. You won't be looking any further for a pair of thermal socks. These socks are made to be three times warmer than any other thermal sock. The materials used for the socks still allow your feet to breath. These socks come in seven different color choices. The length of the socks provides good boot coverage. Some complaints that after only a couple of washes the socks began to wear thin. Some have seen that the socks become stretched over time. This next product on our top ten list will give us a first look at a reusable form of foot warmer. Reusable types are great for those who work out in the cold as they last for several years. As we have already stated, these can be used from one day to the next when working out in the cold. This makes this product a more cost-effective way to go. All you really have to do is remember to charge the battery for the following days use. This product is in the form of an insole so you can place them in any of your footwear. This allows you to use them in your shoes as well as your boots. A warmer such as this will eliminate the worry of adding bulk that is sometimes a hassle with thermal socks. Yes, a product such as this will cost slightly more up front than the disposable type. But when thinking of the end game, if you use a foot warmer on a daily basis, the one-time purchase far outweighs constantly spending on the disposable form. This type of foot warmer can be used over and over again. This will include the battery and the charger. Since these are insoles you can move them from shoe to boot. More cost effective for a long-term solution. Some have stated that the directions for use are not very clear. There are questions about the durability of the product. Here we will take a look at another great thermal sock option. These provide your feet with a few added benefits aside from the warmth. When looking at the name of the socks you are probably thinking that these will definitely defend against the cold. 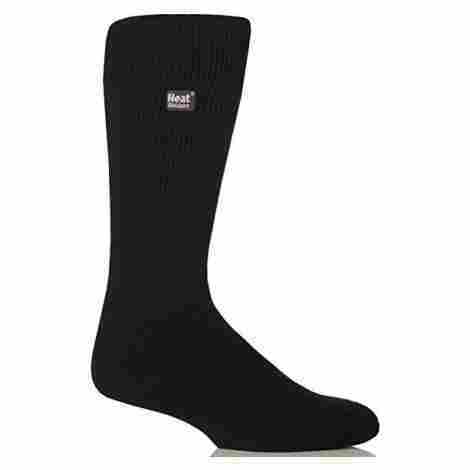 These thermal socks are made from a top quality form of wool, which helps to keep your feet warm at all costs. Not only does the wool keep you warm, it also adds to the comfort fit of the sock in general. These are loaded with other potential benefits besides for their warming properties. They have been designed to hold their shape, which defends against stretching. The materials used also defend against bacteria that can be caused by foot odors. These are even said to have a cooling effect in the summer months. You will notice that thermal socks cost more than what you pay for your average pair, but one must think of the quality they are getting for the price. Do your everyday socks do as much as these thermal socks can do? Made to defend against odor and bacteria. These thermal socks were developed to hold their shape. These are made for colder temperatures. The socks are soft and comfortable. Complaints that the socks do run large. Some have complained that the socks are a bit bulkier than expected. First on our list comes an option for keeping your feet warm while in the comfort of your own home. Speaking of comfort, these slippers will keep your feet cozy, warm and happy. These come in a number of material options for keeping your feet toasty. With uppers made from materials such as Berber and fleece, you can be sure that your feet will be warm even if you are running out to check the mail. The bottoms are constructed so that you can wear them both inside and out. The sides of the slippers are made from suede, which helps to lock out moisture while walking through a dew-filled lawn. 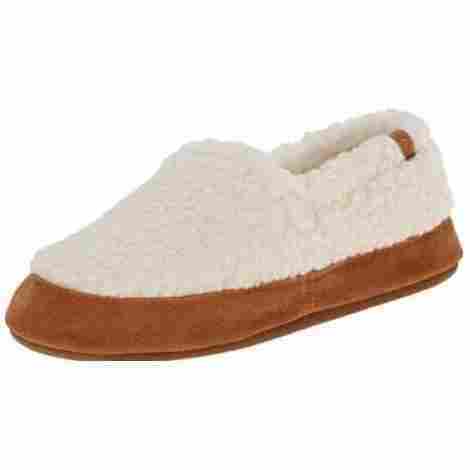 Once you step into the memory foam slippers, you will feel as though you are walking on air. Although these are not the cheapest pair of slippers on the market, what you lose in cost you will gain in quality. Add to that the amount of durability the slippers have and you can be sure that your feet will be happy for years to come. These come in a wide variety of colors and patterns. The slippers can be worn inside or out. The bottoms of the slipper have good traction. Materials used in the slippers provide comfort and warmth. These slippers are wider than normal slippers. The slippers tend to stretch easily. Next on the list comes our first look at a disposable option. These are definitely made for those looking for both ease of use and convenience. You can start your day out using these or carry them along to use them when you need them. Since these are disposable, they will be activated by air. Once exposed to the air, the insole will begin to heat. When that warming effect seems to taper off, expose the insole to the air to activate the heat once again. These insoles are thin so you won't even know you have them on. Want to save them for when you truly need them? No problem, these can be carried in a bag or pocket to be worn later. The adhesive back makes placing these insoles a breeze. These are perfect for those who don't spend a ton of time in the cold. You can purchase a set when you need them then simply toss them when the time is right. 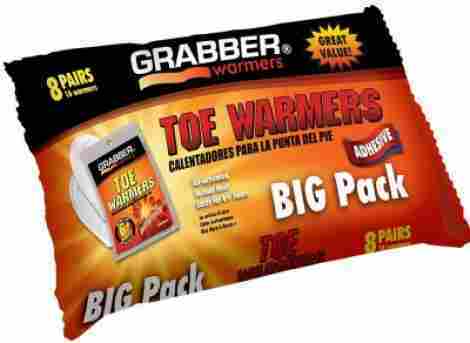 When you don't spend a lot of time outdoors, a set of disposable foot warmers can be extremely valuable. These are made to be disposale. Air activated so the warming process can sometimes be restarted. They have adhesive backing to secure the insoles. Insoles are thin and comfortable. Not suitable for use with certain health comnditions. These are not good for adults with smaller sized feet as they are too big. Here we have another option for keeping your toes warm when you need it the most. This product is made by a manufacturer that consumers have grown to be dependant on over the years. The brand that manufactures these has proven itself to be dependable time after time. That is certainly the case with this product as well. Known for lasting up to six hours, which is more than some of the others on the market, you can trust that your feet will be toasty. These have an adhesive back to them, so applying them to your feet is as easy as 1-2-3. Peel away the protective paper from the adhesive backing, place it where you want it, and you are all set to go. No fuss, no stress just a straightforward system. These come in several different packaging sizes all at different costs to the consumer. The amount you need will be up to you to decide. The brand that produces these takes pride in being one of the most dependable on the market. These are made by a brand known for dependability. The warmers have an adhesive backing to secure the warmer. These are made to be disposable. Sold in several different quantities. There have been complaints that the heat from these lacks consistence. 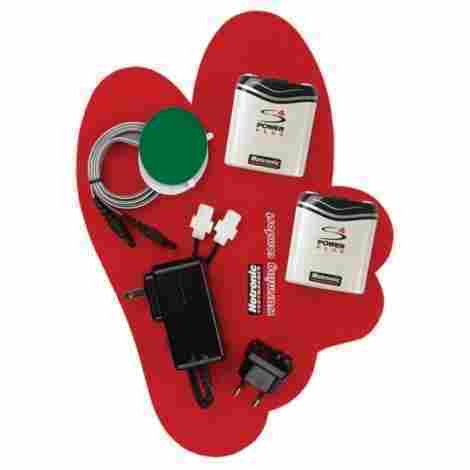 Now that you have had the opportunity to go over the list of choices we have provided, it is really up to you to decide which foot warmer will work best for you. Often you will find that having more than one type of foot warmer on hand to be more beneficial. In the next section of this guide, you will find the information we used to create the list of foot warmers. We provide you with this information for a couple of reasons. The first reason is so that you know what all of your options are when looking into purchasing a product. The second reason this is included is so that you can see that we didn’t just throw these items into a hat to choose the good ones. The last section of the guide will be the frequently asked question section, along with a list of our sources. We like to include these in our guide to answer any unresolved questions that may arise. The sources are there for you to check out at your leisure if you would like to do so. After all, we know it helps you, to know where we obtained our information. Choosing the right type of winter gear to suit your situation can depend on some factors. You have to consider your end game, do you want items that you can use for several years to come? Or are you looking for a quick fix while in the moment? The length of time that your items will last can vary significantly by both the manufacturer and the materials used in making the warmer. It is recommended that you check both product reviews and with the manufacturer when seeking out the rated time of use. Before getting any further, it is worthy to mention that having cold feet can be caused by other factors besides the obvious cold weather. Often underlying health issues can cause your feet to become cold a lot faster than usual. In this case, you will want something a little more intense than just thick socks. But before using these products, it is best to consult your physician to be sure that exposure to the cold is safe for your health. Foot warmers can be found in the form of socks, which are typically made from thicker materials like wool to provide you with an added layer of warmth inside of your boots. These socks will also allow your feet to breathe, wicking away the moisture caused by sweat, to keep your feet both dry and warm. Another type of foot warmer, not commonly thought of is slippers. Slippers are great for warming your feet after a long days work out in the cold. They are also a perfect defense against the cold tile floors in your home in the winter. Activated by air: This type of warmer is made from a mix of ingredients that will react when exposed to the air. This reaction is what will cause the warming effect. The warmth created by these will start to subside after an hour or so, but they will typically stay warm for ten hours. You can increase the warmth of these foot warmers by once again exposing them to the air. Battery powered: These are typically found to be socks, that will have wires running through them to distribute heat to your feet strategically. The power source for these are batteries, often they are batteries that can be plugged in for recharging. Rechargeable batteries make this type of foot warmer reusable for many years to come. Powered by USB: A foot warmer that can be charged from your computer or now that technology has come so far you can also plug this type of warmer into the USB port in your car. Most of the time this type of foot warmer is indeed found in the form of a slipper. You can keep a pair in your car for after a long day out on the ice, warming up your feet for the drive home. Foot warmers that are considered to be disposable are those that are activated by the air. These are a one time use, then toss them in the trash type of foot warmer. These work best for those who don’t need to use the foot warmers very often, as they are cheaper than reusable types of foot warmers. Many people will find the disposable foot warmers far more comfortable to use than the reusable version. These are foot warmers that can be recharged or like the ones that run from the USB port on your computer or in your car. The battery-powered option for foot warmers can be slightly bulky at times. So, it is essential that you choose a pair of boots that will accommodate the use of these socks. When placed on the charger, this type of foot warmer can keep your feet cozy while working outdoors day after day. You will, however, need to keep in mind that the batteries for these will only take a certain number of charges, so replacing the batteries may be necessary. The foot warmers that are run by USB port will limit how you can use them, as you will need to be near a port to operate them. Now, this does not mean that this won’t work for you and you don’t always have to be tied down while using them. Most that require a USB port to warm can easily be unplugged so that you can roam the house at your leisure. Many of the options on the market for foot warmers will come as a one size fits all option. Just be sure that when using the foot warmers in conjunction with your shoes or boots, that your feet have the room they need. As for the slipper type foot warmers, it is best to try these on whenever possible to ensure a proper fit. Be sure to follow the directions provided to you by the manufacturer, this will reduce the chances for injuries or burns. Never use the warmer in direct contact with the skin. Burning or skin irritation can occur if this is done. Stop using the warmers if you feel uncomfortable or the warmers seem to be getting too hot. Never open the actual pouch of the warmer if it does open, keep the inner contents away from your skin. It is best to use caution when allowing children to use these warmers. Check with a physician before using the warmers if you are diabetic or have circulation issues. Q: How long do foot warmers typically last? A: That will vary by the type of foot warmer you choose to use. Take for example the USB powered foot warmer; those will continue to work as long as you keep them plugged into the USB port. Battery powered foot warmers will vary for the length of time they will last. Most batteries have both a high and low setting for the battery when placed on low the battery life can last far longer than when on high. The typical lifespan for warming is 4-8 hours, but that will fluctuate by manufacturer and battery type. Air activated foot warmers time of use will vary by the manufacturer. It is best to check the directions before using these. It can also work to your advantage to check the reviews that have been posted about the warmers. Here you will most likely find out whether or not they warm for as long as expected. Q: Are air activated foot warmers considered to be reusable? A: The intended use for the air activated foot warmers is that they are thrown out after using them. Some people have had good luck with placing the warmer into a zipper bag to preserve the heat of the warmer. However, this does not make them reusable. All this trick does is put the warmer on pause, saving the warmth it provides to be used a little later. Q: Is it safe to use foot warmers? A: Most foot warmers on the market are perfectly safe to use. There are a few precautions that will need to be taken for handling the disposable type of foot warmers. The first thing you want to remember is not to place the warmer directly on your skin. Make sure that you don’t come into contact with the inner contents of the warmer, once mixed the materials can cause burning and skin irritation. Q: Can children use the air activated foot warmers? A: Yes air activated children can use foot warmers. It is best to be sure to explain that the warmer should not come into contact with their skin. You should also make it clear to children that if the warmer becomes too hot for them, they should let you know right away. Q: Which type of foot warmer is more cost-effective? A: The answer to this question will depend on your situation. If you spend more extended or more frequent periods of time out in the cold, then a reusable form of foot warmer would be better for your budget. At first, this purchase will seem to be expensive, but in the long run, it is the cheaper way to go. If you don’t spend much time in the cold weather, then you would benefit from the disposable type of foot warmers. They are relatively inexpensive and can be bought in bulk or separately. Q: How do the disposable foot warmers stay in place? A: Most of the disposable foot warmers will come with an adhesive backing for securing the foot warmer in place. With that being said, some foot warmers will have a better quality adhesive than others. Once again, this is where product reviews from other consumers will come in handy. You can be sure that they will let you know whether or not the adhesive is any good. Q: How do the socks that are battery powered work? 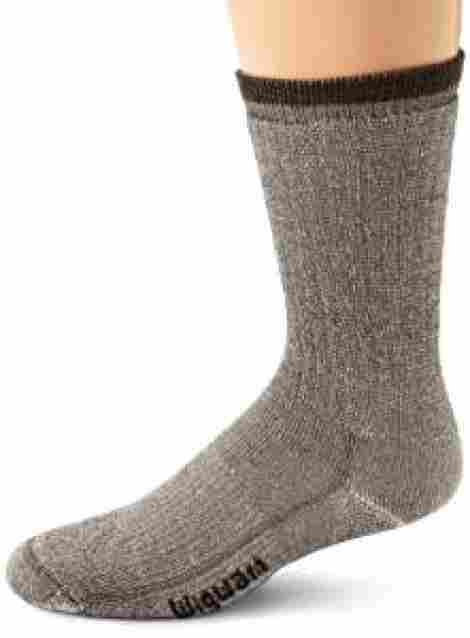 A: These are typically longer socks that will have a series of wires running through them. These wires are located between layers of material and placed strategically throughout the socks. Once you connect the adaptive wire to the battery the wires will begin to warm up throughout the sock and transfer heat to the designated areas. Most of the batteries will have two different power settings either high or low. When placed on low, the life of the battery seems to last longer than when set on the high setting. When finished with the socks for the day, disconnect the battery and place the battery on the charger for the next day. One thing to keep in mind, most rechargeable batteries will only take a charge for a certain number of times. Eventually, you may need to purchase a new set of batteries.